The first of these two books (whose somewhat cumbersome title will be reduced here to What, Che?) defines itself as a linguistic study of the evolution of Irish-Argentine discourse and there is indeed plenty of minute semantic analysis of often bizarre bilingual syntax (this reviewer was unaware of the existence of the pluterperfect tense before reading this book, for example) plus ample etymology but this slender volume is rather more than that – it is also the story of the Irish in Argentina (the only non-Anglophone country to which they emigrated in significant numbers). The Irish influx into Argentina is hard to quantify since they all entered Argentina with British passports during the 1881-1914 heyday of immigration when they may have been as few as 10,000- 11,000 of the 4.2 million Europeans arriving in that period but today Argentines of mostly invisible Irish origins could be as many as half a million. Yet Irish emigration to Argentina also dates back to pre-Famine and even Spanish colonial times. While the Irish contribution to English literature rivals that of the English themselves, there are some big literary names of that origin here – William Bulfin (Tales of the Pampas, 1900), Benito Lynch, the born rebel Rodolfo Walsh and Pacho O’Donnell. 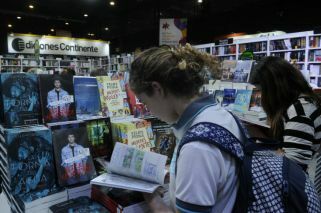 The closing pages of this book are first-hand accounts by 10 Irish-Argentines. Delaney’s latest book, Borges and Irish Writing, is about the distinctive impact of Irish literature on the writing of Jorge Luis Borges (a young man during the Easter rising and the creation of a sovereign Irish state). 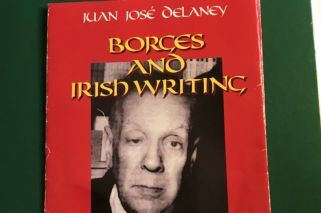 Towards the end of his life Borges even made the pilgrimage to Ireland to participate in the Joyce Week of 1982 where he listed his favourite Irish writers – James Joyce, William Butler Yeats (whom Borges described as a profound poet reflecting his “oppressed and stubborn country”), Jonathan Swift and (“why not?”) Oscar Wilde as well as the lesser-known names of George Moore and Bishop Berkeley. Curiously this list did not include Samuel Beckett although the two writers with “B” surnames shared the Formentor Prize in 1961. Following his 1982 visit Borges wrote a poetic work entitled simply Irlanda. The author of The Aleph found common ground with the labyrinthine themes frequent in Irish writing, while the Yahoos in Gulliver’s Travels reminded the conservative Borges of barbarians in his own country as identified by Domingo Sarmiento. Apart from literature, Borges reviewed John Ford’s The Informer starring Victor McLaglen and set in Ireland’s independence struggle when it screened here in 1935. Much of the book also centres on the Borgian approach to philosophy, citing mediaeval texts in Latin. Delaney is a true scholar. What, Che? Integration, adaptation and assimilation of the Irish-Argentine community through its language and literature by Juan José Delaney, Ediciones Universidad del Salvador, 2017, 181 pages.